A custom 3x8 inch tea length programs square corner full color magnet becomes true signature of love because it details the culmination of love affair into a beautiful relationship. Most of the save the date wedding cards fall into the league of pre-wedding invitations, however a personalized 3x8 inch custom printed tea length programs square corner full color magnet can easily show up as a true wedding invitation. 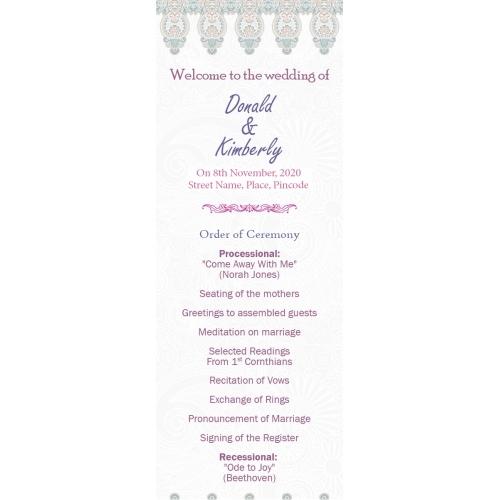 A custom printed tea length programs square corner full color magnet will be retained as a wedding invitation, wedding memoir and fridge art. Couple who are getting married on a short notice and expect a huge participation on their big day can definitely lean on this magnet because it wraps high persuasion power. Product Size : 3 in. x 8 in..